Offering you a complete choice of products which include motion control card. We are an illustrious name of a wide range of Motion Control Card in the market. Motion Control Cards are low-cost solutions for Servo axis automation for various applications. Our offered range of motion control card is widely used to install in various industrial equipment for advanced pulse train motion. These cards can be connected to the PC to generate the high-frequency pulse to the servo drive. 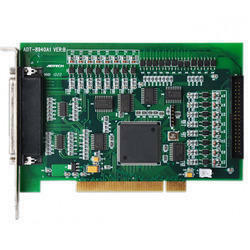 Motion Control Card are low-cost solutions for Servo axis automation for various applications. These Cards can be connected to the PC to generate the high-frequency pulse to the servo drive. The motion control card can control up to 2-4 axis individually or 2 axes synchronized. Interpolation of 2 axes can be linear/Circular.